Looking at the back of the display reveals more interesting facts. Instead of Acer HN274HB the model name apparently remains HN274H, but with a slight difference in the version of the model only. So instead of HN274H bmiiid as the old model, the new model is labeled HN274H Bbmiiid with a part number ET.HH4HE.B04. The fact that the model number remains as HN274H and not HN274HB and the difference is in the version number only might be a bit confusing for a lot of people and it is not impossible that somebody can get the old model instead of the new one. So be careful when looking for the new version with 3D Vision 2 and 3D Lightboost support and wait for a review of the monitor very soon. 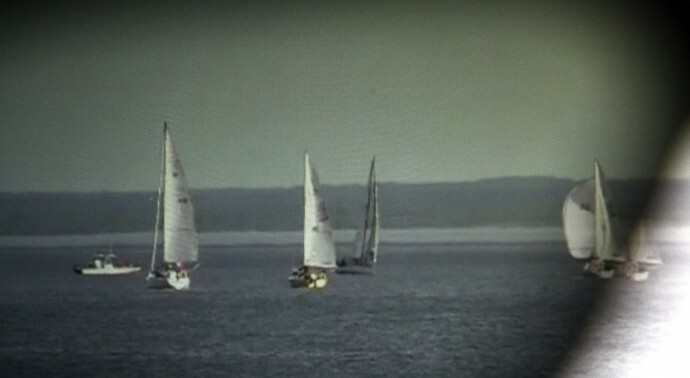 Viewing angle: 170° hor., 160° vert. I’m starting with a check of the service menu (below you can see a guide how to access it), as I wanted to see what type of panel the new Acer GN245HQ monitor uses and the interesting thing here is that the panel is an updated version of the 23.6-inch one used in the previous GD245HQ/GD235HZ models from last year. The panel used in the Acer GD245HQ/GD235HZ was CMO M236-L02, made by Chi Mei Optoelectronics (CMO) and in the new Acer GN245HQ the panel is CMI M236H5-L02 made by the same company that is now called Chimei Innolux Corporation (CMI). The new panel uses LED backlight which helps in getting rid of issues with backlight bleeding (only very slightly visible brighter light at the bottom end of the screen of the test unit) and has improved handling with the issues found in the older panel resolved so no more oversharpening issues in the new model. Of course the level of crosstalk/ghosting is also reduced, but more about these in a bit. The bigger 27-inch Acer HN274H display uses an LCD panel from LG which is quite different in specifications and characteristics from this one from CMI, but it is performing quite well too. 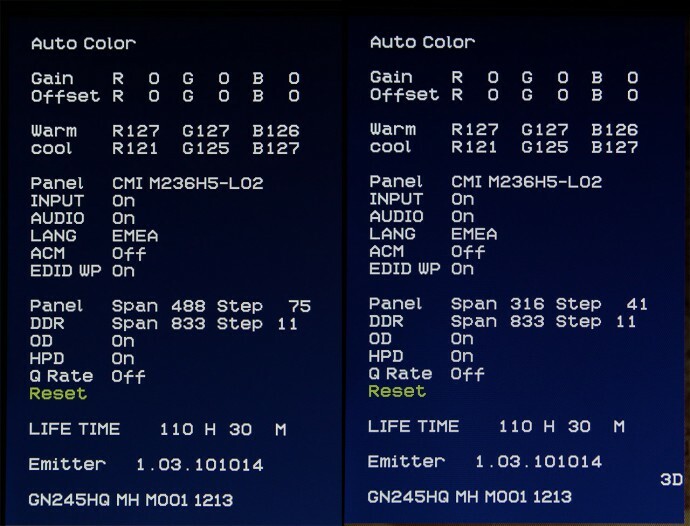 I’ve mentioned that the monitor has a 3D Vision IR emitter integrated and after taking an infrared photo of the monitor I’ve found it at the bottom left part of the monitor, it has four IR LEDs. Top positioning of the emitter might’ve been a better solution however, as getting very close to the monitor might lead to breaking visual line of sight and the glasses loosing the sync signal, however this is not something that will hardly lead to problems in a normal use scenario anyway. The interesting thing about the monitors with integrated IR emitters is that they do not need an extra USB cable to be plugged in the PC, all the synchronization goes through the DVI cable which makes things easier for setting up. The drawback of not having an external IR emitter for the 3D Vision is that you don’t have the handy button for turning on/off the 3D effect as well as the useful wheel for 3D depth adjustment, so you need to stick to the keyboard shortcuts for these actions. Of course there is no problem if you plug in an external IR emitter in the computer, the only thing is that you will not have both emitters running at the same time, so only the external one should be active. Another thing that you should consider with the Acer GN245HQ as well as the bigger Acer HN274H is that they only come in versions with built-in IR emitter and bundled active shutter glasses from Nvidia which makes their price higher than for only a monitor. This of course is useful if this is your first 3D-capable monitor as you get the whole bundle at once and with a more affordable price, but the total price won’t be as attractive if you already have 3D Vision glasses and IR emitter like if you are upgrading from an older 3D monitor. 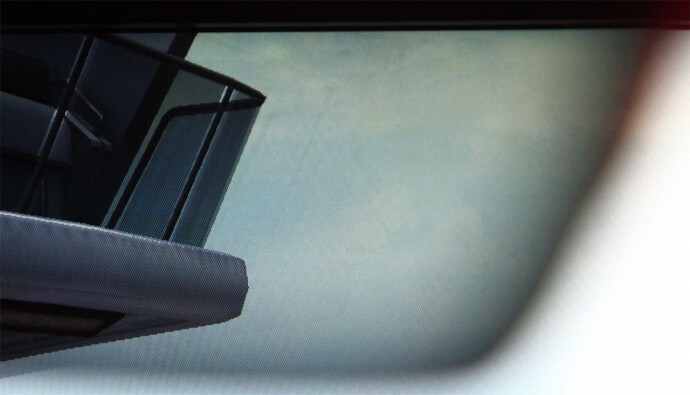 The standard factory settings for the Acer GN245HQ monitor do not provide great color accuracy, there is quite high color deviation from the reference colors. 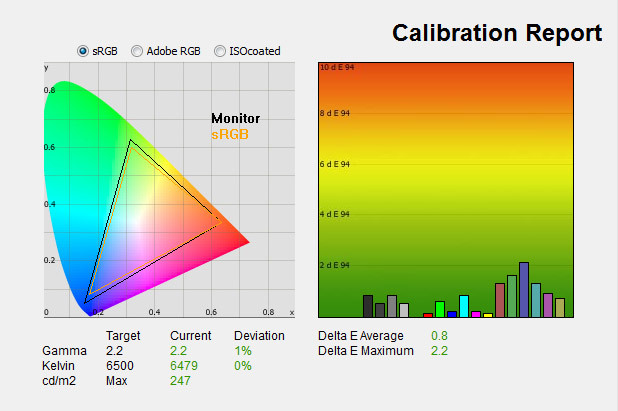 But here more interesting is the result for the maximum brightness and contrast levels, according to the specifications the monitor should provide up to 300 cd/m2 and the measurement has showed 291 candelas per square meter which is pretty close, considering the fact that the monitor is not maxed out. The measured black level was about 0.267 cd/m2 and as a result the contrast level was about 1089:1 which is a bit over the specs of 1000:1, so a great performance here. Higher brightness levels and good contrast is a must for 3D-capable monitors in order for them to provide good experience when in darker environments in games or when watching dark scenes in 3D movies etc. 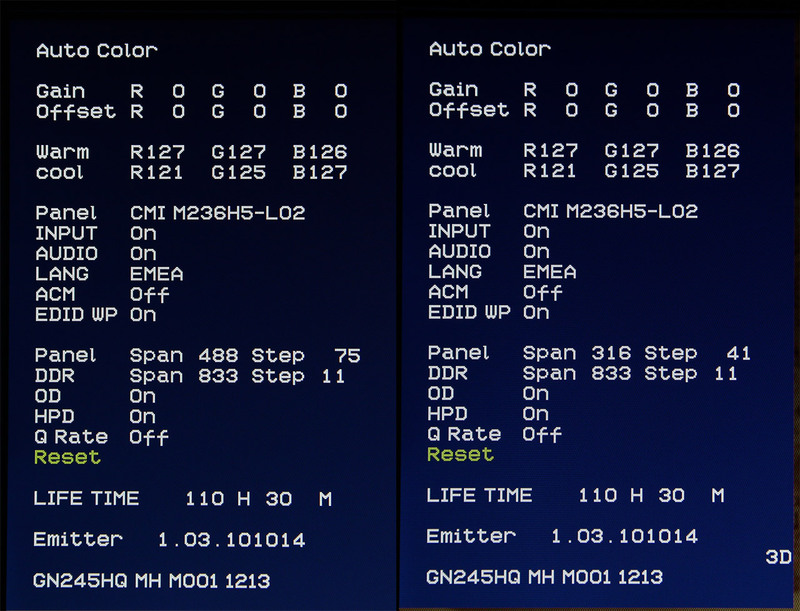 And how things change after going through a color calibration. 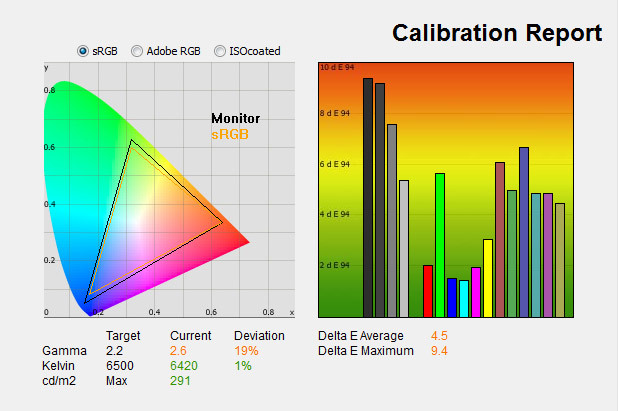 Now the monitor has 247 cd/m2 maximum brightness as the calibration is done is a way to preserve the maximum possible brightness level, and still an average Delta E of less than 1 is achieved which means really good color accuracy can be achieved with even though this is a TN panel. After the calibration the black level is 0.264 cd/m2 and the contrast is reduced to about 926:1, but the image on the screen is also visually more pleasing as compared to the default settings, so it is not only something that can be measured with special hardware. Still if you need a display in order to work with colors this might still not be the best choice, you better go for something more professional that is designed with color accuracy and for people working with colors. This is after all a gaming monitor, but it is up to you, with color calibration you can get really good results even from it, partly thanks to the LED backlight as well. On the other hand, if you are not into stereoscopic 3D multimedia or gaming and just need a good 120Hz LCD monitor, this one might be a good option to consider. Unfortunately the Acer GN245HQ is not without input lag, but the input lag measured was at maximum about 15 milliseconds with an average of about 8 which is pretty good and hardly noticeable even by users more sensitive to lag. Still it would’ve been nicer if there was no input lag at all, but there still seem to be very few 120Hz LCD monitors that don’t have input lag and the same goes for normal 60Hz non-3D displays as well. Moving to the extreme crosstalk tests with the specially made 3D test photos that I’ve made available here should you wish to compare. 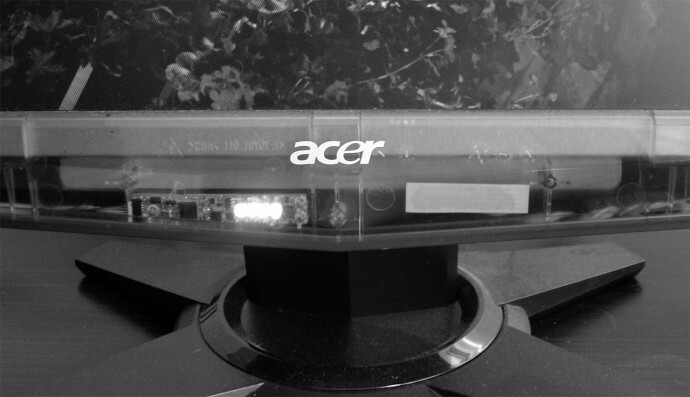 The result here is quite good and very close to the one provided by the 27-inch Acer HN274H. If you take a closer look at the white result you will notice that the Acer GN245HQ also suffers from the same white banding issue that I’ve first noticed on the Planar SA2311W. This of course is a result of pushing the overdrive function in order to further reduce ghosting in stereo 3D mode and what you are seeing in the extreme test photos I’m using is not something that you will notice in normal use, so this is something that I’ve actually expected to see (the 27-inch Acer also had it, although less apparent). Next is the sailboats stereoscopic 3D test video, a real world crosstalk test to show you that the specific issue described above does not usually create any problems with normal use for stereo 3D content. 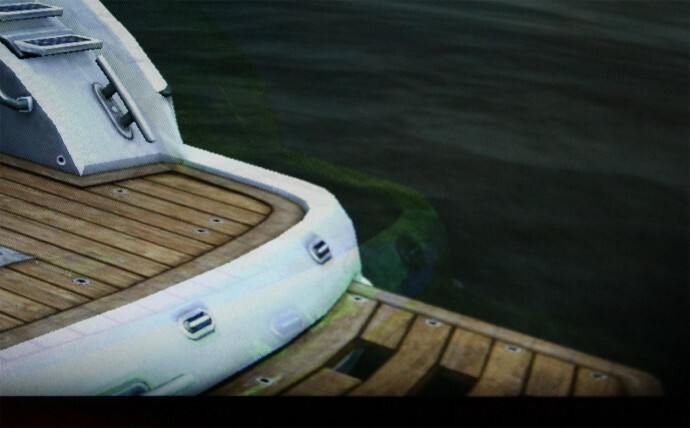 Here there is no crosstalk/ghosting visible with the named eye in normal use, although there is some slightly visible if you take a very closer look. Anyway, great result in this test, but not as good as the Planar SA2311W that is still probably the 3D LCD monitor with least crosstalk that I’ve tested so far. Switching to a real game, namely Tomb Raider: Underworld as one of my favorite games to play in stereo 3D and to test for crosstalk/ghosting with. First looking at the top of the screen, very faint traces of ghosting that are hardly visible in normal use, very similar to what the Planar SA2311W 3D monitor provides and better than the 27-inch Ace HN274H. The situation with the bottom part of the screen and the crosstalk there is a bit worse however, the color ghosting due to the overdrive here is slightly more apparent, although still in tolerable levels. Still the overall crosstalk/ghosting level is not that high, although the situation could’ve been better, tweaking a bit the Overdrive function might’ve provided a more balanced overall results and making the Acer GN245HQ perform even better in terms of crosstalk/ghosting or actually the lack of such. 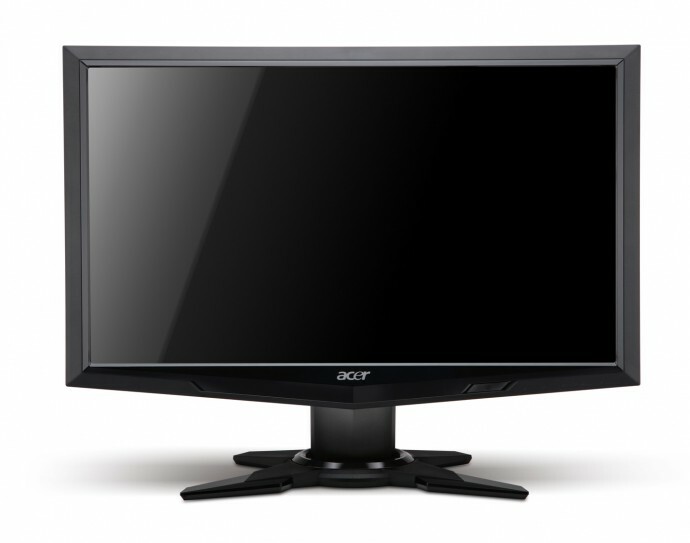 Acer GN245HQ comes as a worthy successor of the previous Acer GD245HQ/GD235HZ, performing better and with some nice extra features, but it was a bit short on becoming the best overall 3D gaming LCD monitor currently available. It did not manage to overthrow Planar SA2311W by providing less crosstalk, although the Acer comes pretty close to the results show by the Planar in most tests. There is some input lag present, roughly the same amount as the old GD245HQ/GN235HQ had, which can be a bit of a setback for some more demanding gamers willing to get a 120Hz LCD monitor for gaming with 120Hz refresh rate and not in stereo 3D mode. The presence of HDMI 1.4 3D support is a nice extra, allowing you to use the monitor with more 3D-capable devices other than your PC, however you are still limited as there is no support for Side by Side, Over/Under and some other 3D input formats that are usually supported by 3D HDTVs. And the overall conclusion is that the Acer GN245HQ is actually a great choice if you are just going to be getting into stereo 3D support on the PC and not only. 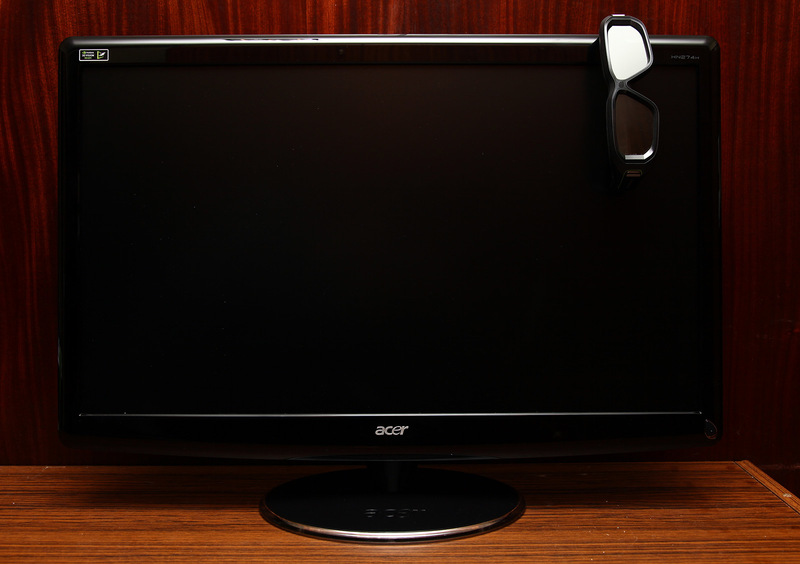 As there is still no perfect 3D monitor that excels in just about everything, the Acer GN245HQ does provide very good results in overall, and thanks to the built-in IR emitter and bundled 3D Vision glasses it is a good starter choice if you want a 24-inch 3D capable solution. If you are thinking about upgrading to the Acer GN245HQ, then it depends on what is your old stereo 3D monitor at the moment, if it is a first generation one from Samsung or Viewsonic, then you should upgrade… if not, then it depends on what your specific requirements are.